Okay, it’s not a class 5 rapid or anything, but at 2 to 3 times its normal very tame height and flow, Monument Creek in Colorado Springs, CO is “raging” after thunderstorms and flash flood warnings. 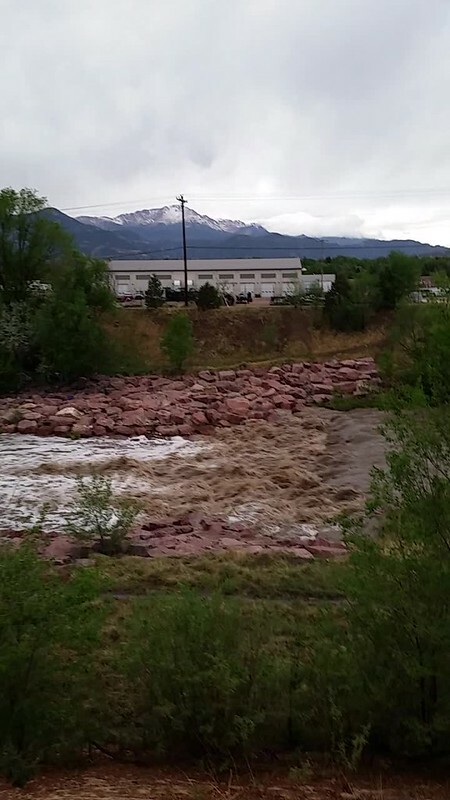 Pikes Peak can be seen in the background behind some power lines. I actually took this VERY short video when trying to take a photo on today’s run, so it was very rushed and not very good. Kept it because of the sound of the rushing water was still kind of impressive. I went out on my run today just before sunset. There had been a lot of dramatic thunderstorms, hail and flash flood warning earlier in the day. It had been several hours previous to this, so I was a little shocked by the size of our little local creek. Had to take some photos and apparently one video by mistake. Below is a little slide show of the rushed pics I took.